Bollywood actor Alia Bhatt will soon be seen in Zoya Akhtar’s directorial film Gully Boy opposite Ranveer Singh. Currently, she is busy promoting the film which is slated to release on February 14. The trailer of the film has received positive reviews so far and has also been the target of viral memes of social media. Raazi actor’s dialogue from Gully Boy has taken the Internet by storm. The famous ‘dhoptungi’ dialogue has now also made its way to the Musically App. Since then, millions of clips dubbing her popular dialogue has flooded the social media. However, now a video of a girl recreating Alia’s scene has gone crazily viral on the internet. Not only this, but the girl looks like a carbon copy of Alia. 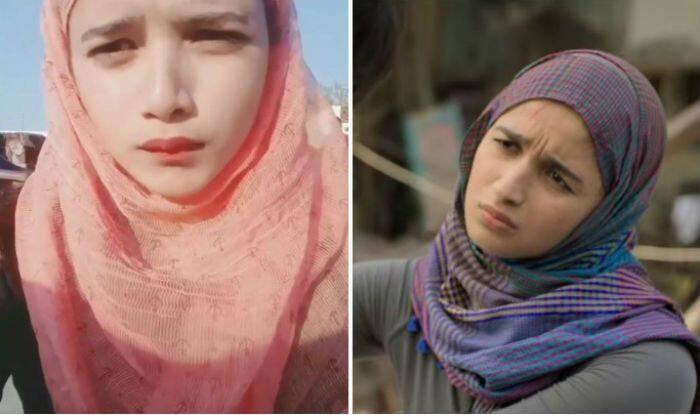 After Anushka Sharma’s doppelganger, netizens have now found a lookalike of Alia too. The girl named Sanaya Ashu has an uncanny resemblance with Alia Bhatt and you just can’t ignore how similar they look. In the video, Sanaya has wrapped a pink scarf around her head and her expressions are giving major competition to Alia Bhatt. Gully Boy is directed by Zoya Akhtar and also features Kalki Koechlin, Vijay Raaz, Siddhant Chaturvedi, Vijay Varma and Amruta Subhash in lead roles and is slated to release on February 14 this year. The movie is bankrolled by Farhan Akhtar and Ritesh Sidwani’s Excel Entertainment. Ranveer will be seen playing the role of a rapper in the movie. On a related note, Alia will next be seen in Kalank.